It is thin sliced beef and onion cooked with soy sauce, mirin or sugar, and dashi stock. 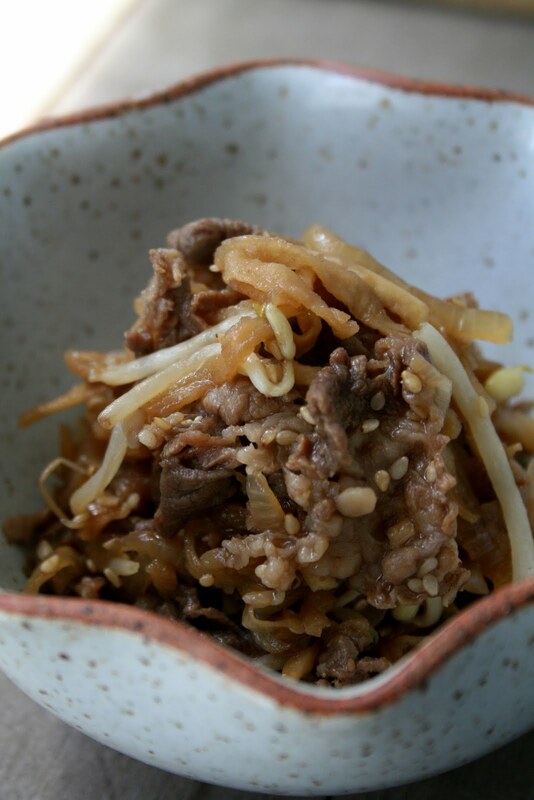 It's usually poured on over steamed rice, and one of the most famous DONBURI dish in Japan. DONBURI is a rice dish with some kind of cooked dish over steamed rice in a bowl. Yoshino-Ya, is one of the most famous Gyu-Don shop back in 80's - 90's when I was in Japan. There might be more chain shop or restaurant by now for this convienient, easy-to-grab rice bowl dish, and a lot of people love to eat this. My revised version, I added Kiriboshi-Daikon=dried daikon which has high in dietary fiber, and sesame seed for nice crunchy texture with bean sprout at the very end. I probably can eat 2 bowls (and Big One, too!) of rice with this.